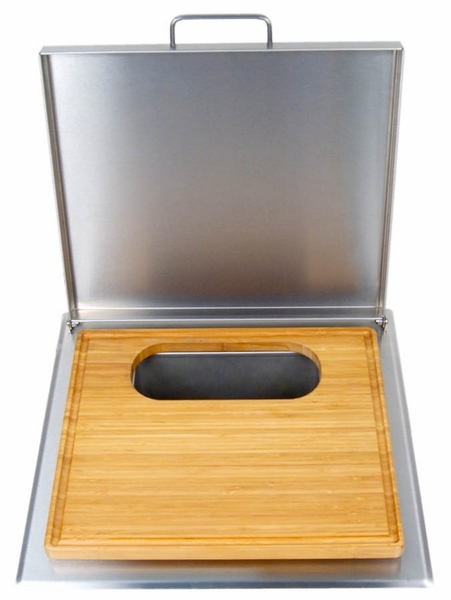 Take care of all your chopping and dicing tasks with this easy-to-use cutting board that is designed for use on any grill island counter top. Cleaning up the scraps is easy because of the trash chute located toward the back of the board. Just chop and sweep the remnants away into the chute. You can use it with any trash can simply placed underneath the chute. Preparing your gourmet meals outside couldn't be made any easier. WARNING: Cancer and Reproductive Harm. For more information go to www.P65Warnings.ca.gov.